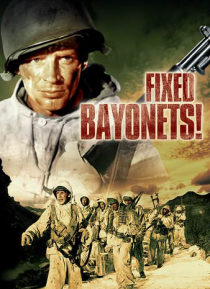 IHG® Rewards Club - Film - Fixed Bayonets! Corporal Denno is a novice to the Korean War and abhors killing. He's afraid to take the life of another. When his division is routed out of the mountains, he must watch helplessly as all of his commanders are picked off one by one; finally he must take command of the troops himself. In the drama that follows, Denno learns what he will do to survive, and how ready he really is to kill. This gritty… war drama was directed by Samuel Fuller.